Thanks for the post. Interesting news. Obviously a little early to determine whether Gonzalez is going to be let out of his NLI . . .or whether Porter would be any more interested than in Geno West. Dean Murdoch wrote: PG or SG? We know who West (11) and Hepa (33) are in the picture, but who is the third Jefferson player, #1? It turns out he’s 6-5 sophomore (2019) guard Marcus Tsohonis, and he already has known offers from USC (the one from the Pac-12, not the SEC) and Montana. 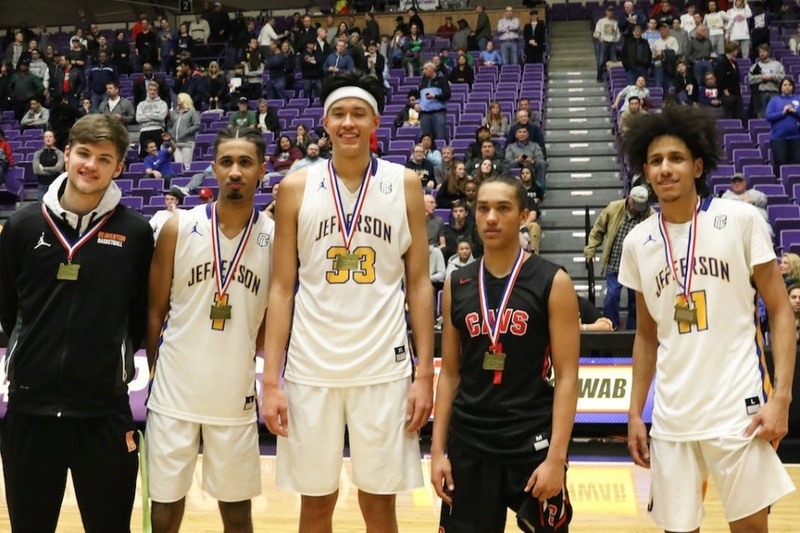 The other two in the picture are 6-4 sophomore Jake Estep (Beaverton) and 5-8/150 Elijah Gonzalez (Clackamas), the senior point guard committed to Portland State. "I believe he's really too small for the WCC": TJ Campbell was what? And Jeremiah Dominguez was how tall? This young man is taller by a number of inches and a scorer. I have not seen him play so do not know whether he can shoot threes. Maybe West is the better alternative because of size? Still it appears Porter is focused on JC points: hope we hear soon that his efforts and that of the staff net an impact player point guard. Speaking of coaches out--Lorenzo Romar out at UW. Can't imagine that will impact our recruiting. I didn't say too short, just not big enough. TJ is my all-time favorite UP point guard...he has a footballer's body. West is NOT a point guard, and he's really not a pure shooting guard either....he's more of a 2/3 combo....a very useful combo in the WCC. Romar...great guy, great recruiter, just didn't get it done as a coach. Maybe Michael Porter, Jr would like to join 3 more Porters at UP for his one-and-done year. I heard the California coach resigned and took the Missouri job, and hired Michael Porter Sr as an assistant. I'm sure for his teaching skills. DoubleDipper wrote: Gonzalez is definitely a point guard, but I believe he's really too small for the WCC; listed at something like 5-8/150, I think that's a stretch. Apparently Gonzalez is no longer signed at PSU after the coaching change there (not indicated on VC), and UP had him in for a look. Turns out he's got talent, but the coaches judged that he's just way too undersized to play in the WCC. As we suspected, UP did make Geno West a late offer, but West had been recruited by Idaho for four years prior to his signing there. You've got to respect loyalty from a recruit and the fact he wants to be a Vandal in Moscow!